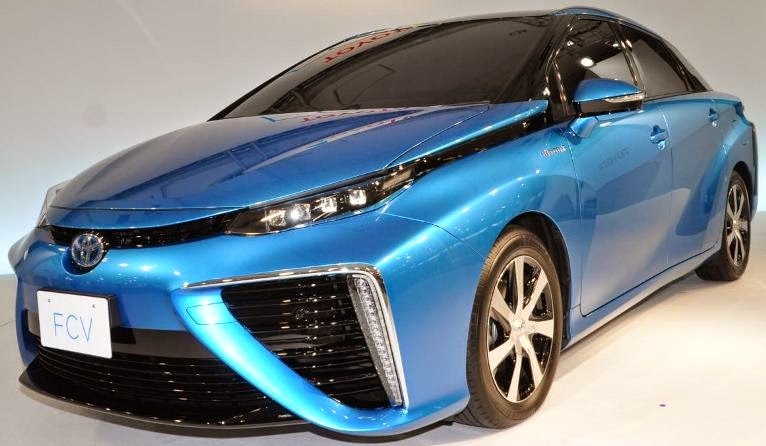 The Toyota FCV, Toyota’s first commercial zero-emission hydrogen fuel cell electric vehicle was unveiled in Japan and will go on sale in the Japan domestic market before April 2015 for approximately 7 million yen, or at more than $68,000 based on current exchange rates. The FCV goes on sale in the summer 2015 in Europe and the state of California with pricing not yet been set. In May, the company announced a financial relationship with First Element Fuels to support the long-term operation and maintenance of 19 new hydrogen refueling stations across the state. 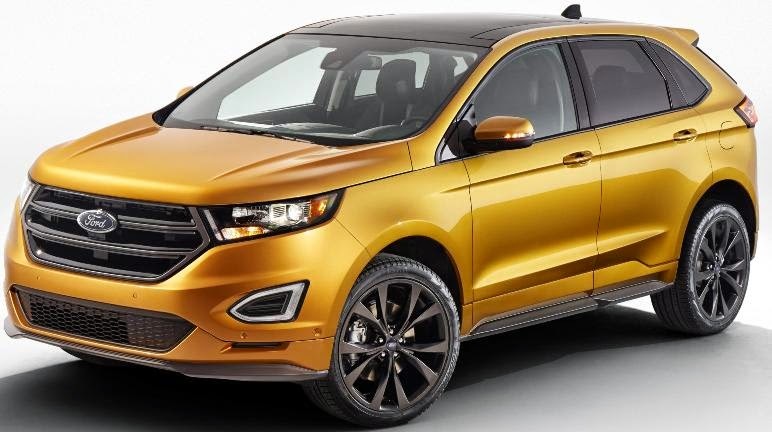 The all-new 2015 Ford Edge will be powered by a standard 245 horsepower twin-scroll 2.0-liter EcoBoost® four-cylinder, a more than 300 horsepower 2.7-liter EcoBoost V6 or a normally aspirated 3.5-liter V6 engine. All will be equipped with dual output exhaust and mated to Ford’s SelectShift® six-speed automatic transmission with paddle-shift activation. The front-wheel-drive Edge, first launched in 2006, is all-new from wheels to roof and slightly longer and taller for the new 2015 model with the wheelbase increasing by 1.0 inch, to 112.2 inches. The 2015 Edge will be built at Ford’s Canadian Oakville Assembly Complex near Toronto and will go on sale in North America in the first quarter of 2015. The 2015 Hyundai Sonata Eco is a third variant of the mid-size sedan that's powered by a 177 horsepower 1.6-liter turbocharged Gamma four-cylinder engine mated to a new seven-speed dual-clutch transmission which together is expected to deliver a combined fuel economy rating of 32 miles per gallon (an estimated 28 mpg city and 38 mpg highway). 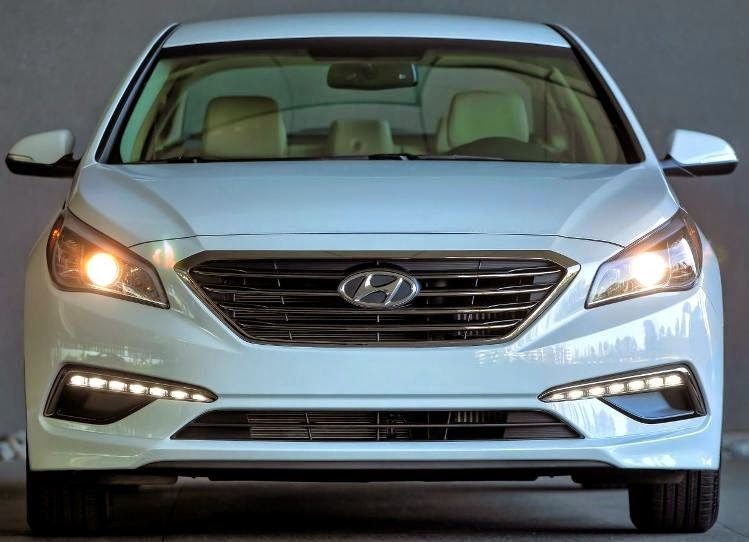 The 2015 Hyundai Sonata Eco will start at $24,085 (including $810 freight charge) with an optional $4,100 Technology Package. It will go into production at the Hyundai Motor Manufacturing Alabama plant later this summer. Technology issues have increased complaints by new car owners over last year according to the J.D. Power 2014 U.S. Initial Quality Study. The study, now in its 28th year, examines problems experienced by vehicle owners during the first 90 days of ownership. Initial quality is determined by the number of problems experienced per 100 vehicles (PP100), with a lower score reflecting higher quality. 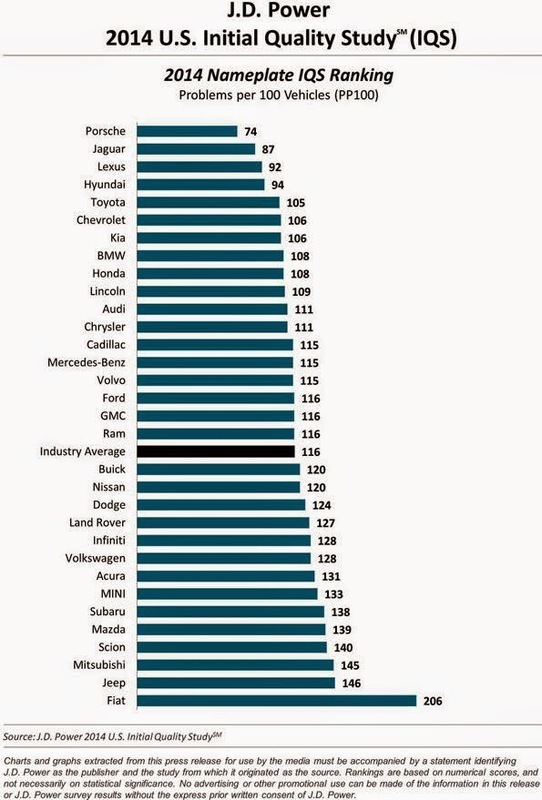 Porsche ranks highest in the IQS for a second consecutive year, followed by Jaguar, Lexus and Hyundai (see table). General Motors received six segment awards, more than any other automaker for a second consecutive year, for the Buick Encore (tie); Chevrolet Malibu; Chevrolet Silverado HD; Chevrolet Suburban (tie); GMC Terrain; and GMC Yukon (tie). Hyundai Motor Company receives five awards for the Hyundai Accent; Hyundai Elantra; Hyundai Genesis; Kia Cadenza; and Kia Sportage (tie). Ford had the Edge, F-150 LD and Lincoln MKX. Nissan award winners were the Infiniti QX50, Infiniti QX80 and Nissan JUKE [tie]. Volkswagen's category-topping vehciles were Porsche 911, Porsche Boxster and Porsche Panamera. Fiat Chrysler Automobiles had the Chrysler Town & Country and Dodge Challenger and Mazda, the MAZDA5 and MX-5 Miata. Other models receiving awards are the Honda Ridgeline and Lexus ES. The new hand-built Bentley Continental GT3-R two seat luxury performance car with a 572 horsepower 4.0-liter twin-turbo V8 engine feeding an all-wheel drive system with torque vectoring for the first time is mated to a eight-speed ZF automatic transmission. The Bentley Continental GT3-R has a top speed of 170 mph and features Beluga black leather with diamond-quilted Alcantara®, Drive and Sport modes, a two-seat cabin handcrafted from carbon fibre and free standard servicing for four years at the 10,000, 20,000 and 30,000 mile marks. Orders for the 300 Continental GT3-Rs that will made are open now, with deliveries to start late in 2014. Ford identified an error with fuel economy ratings through its internal testing and notified EPA on approximately 200,000 Ford Fiesta, Fusion and C-MAX and Lincoln MKZ vehicles that have been sold or leased to customers in the United States and will give affected owners and lessees a range of goodwill payments of $125 for a Fiesta lease customer to $1,050 for a Lincoln purchase customer for the estimated average fuel cost of the difference between the two fuel economy labels. Ford worked with EPA which retested the vehicles to determine the correct fuel economy ratings. The biggest miles-per-gallon adjustment is on the Lincoln MKZ hybrid from 45 mpg combined city/highway down to a revised 38 mpg. 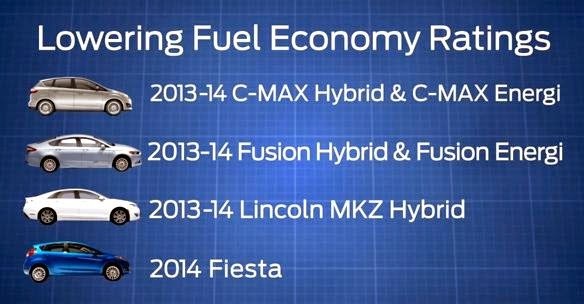 The Fusion hybrid fuel economy rating was revised from 47 mpg to 42 mpg. The MINI Hardtop 4 door has a wheelbase that's 2.9 inches longer and a body lengthened by 6.3 inches as compared to the new MINI Hardtop 2 door with a choice of a 1.5-liter 134 horsepower 3-cylinder engine to power the MINI Cooper Hardtop 4 door and a 2.0-liter 189 horsepower 4-cylinder engine in the MINI Cooper S Hardtop 4 door. With MINI TwinPower Turbo Technology both engines are mated to newly developed 6-speed manual and 6-speed Steptronic transmissions. The MINI Hardtop 4 Door will cost $1,000 more than the MINI Hardtop 2 door. The all-new 2015 BMW X6 second generation Sports Activity Coupe comes in a rear-wheel drive model for the first time. The X6 sDrive35i is powered by BMW’s 300 horsepower TwinPower Turbo inline six engine and joins the all-wheel drive BMW X6 xDrive35i and the X6 xDrive50i featuring BMW’s updated 445 horsepower TwinPower Turbo 4.4-liter V8. All models are equipped with BMW’s 8-speed Steptronic sport automatic transmission. 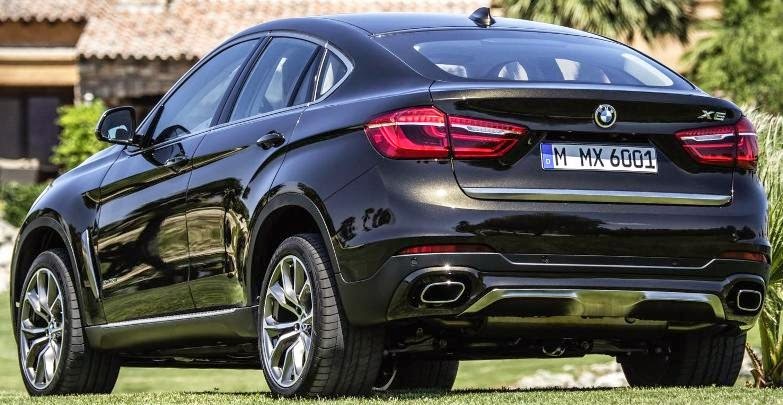 The new 2015 BMW X6 will again be produced exclusively at the company’s production facility in Spartanburg, South Carolina and will arrive in US showrooms in late 2014. Pricing will be announced closer to launch. Kia's 2014 FIFA World Cup campaign - “For One Month, Let’s All be Fútbol Fans” - features supermodel Adriana Lima who was in Kia's 2012 “Drive the Dream” Super Bowl commercial, the 2015 Optima midsize sedan and Sorento CUV. Click on the links below for the three TV commercials we will see while watching the most viewed sporting event in the world. Adriana Lima Brings Futbol to a Sports Bar, Adriana Lima Football vs. Futbol and Adriana Lima Transforms a Man Cave. The new Honda Civic Natural Gas, with a combined EPA fuel economy rating of 31 mpg and a fuel cost savings of up to 40-percent compared to gasoline, is being upgraded with leather seats, heated front seats, heated side mirrors, a six-speaker audio system, a new Display Audio with 7-inch touchscreen that allows users to pinch, swipe and tap just like a smartphone to access audio, phonebook, media, vehicle information and available navigation features. Californians receive an immediate $1,000 purchase credit from the California Energy Commission. The supply of purchase credits through the California Energy Commission is limited to 1,600 and expires when all have been distributed or on April 22, 2015, whichever occurs first. 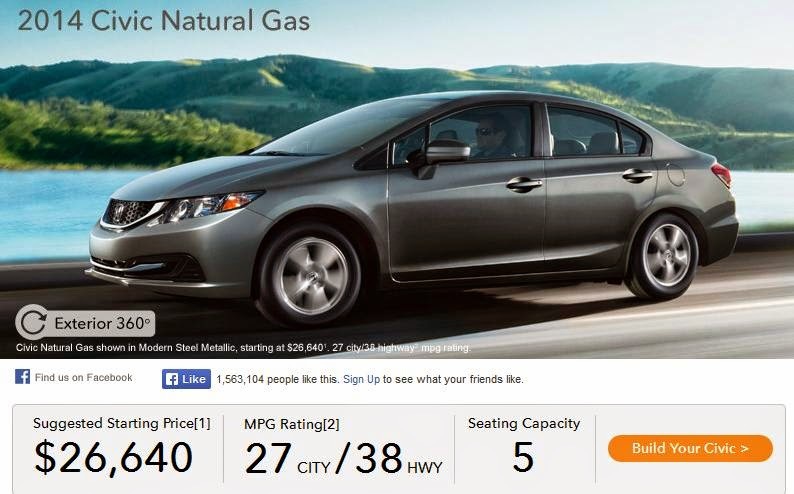 Civic Natural Gas vehicle customers in California qualify for single-occupant access to High Occupancy Vehicle "carpool" and High Occupancy Toll (HOT) lanes. There are more than 150 compressed natural gas stations refueling stations in California, more than any other state. General Motors dealers delivered 284,694 vehicles in the United States in May, up 12.8 percent compared to a year ago, marking the company’s best May in seven years and its best total sales since August 2008. Retail sales were up 10 percent while fleet sales were up 21 percent. Year-to-date, GM sales are 1,188,407, a 2.8 percent increase over 2013. Ford Motor Company U.S. sales totaled 254,084 vehicles in May, up 3 percent from a year ago. Retail sales set several model records with 174,889 vehicles sold, an increase of 6 percent. Year-to-date, Ford sales are 1,047,968, decline of 0.9 percent from 2013. Toyota Motor Sales, U.S.A. reported May 2014 sales of 243,236, an increase of 17 percent from May 2013 on a raw-volume basis. Year-to-date Toyota sales are 963,893, up 5.5 percent over last year. Chrysler Group reported U.S. sales of 194,421, a 17 percent increase compared with sales in May 2013 for the group’s best May sales since 2007. Year-to-date sales are 849,037, a 13 percent increase over last year. American Honda Motor reported May 2014 Honda and Acura vehicle sales of 152,603, an increase of 9.0 percent compared to May 2013. The Honda Division posted an increase of 9.8 percent with May sales of 137,928. Acura division gained 2.2 percent on May sales of 14,675. Year-to-date American Honda sales reached 610,413, up 0.3 percent from 2013. Nissan Group announced total U.S. sales for May 2014 of 135,934, an increase of 18.8 percent over the prior year and a May record. Year-to-date sales of 594,834 is 14.3 percent higher than 2013. Hyundai Motor America just closed its best month ever with May sales of 70,907, up 3.7 percent versus the same period a year ago. Year-to-date sales of 297,027 is up 0.3 percent from last year. Kia Motors America had its all-time best monthly sales total in May of 60,087, a 14.8 percent increase over the same period in 2013 and the first time KMA has achieved more than 60,000 sales in a single month. Year-to-date sales of 246,769 is an 8.8 percent increase over last year. Subaru of America reported 44,170 vehicle sales for May 2014, a 11 percent increase over May 2013 sales, the best-ever May sales month in company history. Year-to-date sales for Subaru is 196,641, a 19 percent increase over the same period in 2013. Subaru has now seen 30 consecutive months of year-over-year growth and is already on its way to its sixth successive annual sales record. Volkswagen of America reported it delivered 32,163 vehicles in May, down 15.4 percent from a year ago and year-to-date VW sales are 150,317, an 11.5 percent fall from 2013. Separately, Audi reported May 2014 sales of 16,601 vehicles, up 25.5 percent over last year and the brand’s second-best month ever. Audi year-to-date has sales of 67,482, an 11.4 percent increase over last year. The BMW Group in the U.S. (BMW and MINI combined) reported May sales of 35,331 vehicles, an increase of 13.3 percent from the same month a year ago. Year-to-date, the BMW Group (BMW and MINI combined) is up 4.9 percent on sales of 145,957 in the first five months of 2014 compared to the same period in 2013. Mazda North American Operations reported May U.S. sales of 29,731 vehicles, representing an increase of 22.5 percent versus last year. Year-to-date sales through May are up 6.4 percent versus last year, with 130,223 vehicles sold. Mercedes-Benz USA reported its highest May sales on record of 29,570 across the Mercedes-Benz, Sprinter and smart model lines, an increase of 8.1 perdent from the same period last year. The Mercedes-Benz brand alone posted May retails of 26,617, up 7.7 percent for the month, while year-to-date volumes reached 125,118, up 6.5 percent. Adding year-to-date sales of 9,282 for Sprinter Vans (up 23.5%) and 3,974 units at smart (up 8%), MBUSA achieved a year-to-date grand total of 138,374. Mitsubishi Motors North America reported May sales of 7,269, a 54.2 percent increase over the sales total from May 2013. It was the best May sales total for Mitsubishi Motors in the last three years and also the second-best May sales for MMNA since 2008. Year-to-date sales of 33,651 is 34 percent higher than 2013. Jaguar Land Rover North America May U.S. sales for both brands hit 5,840, a 17 percent increase from May 2013. For the year 2014, Jaguar Land Rover North America sold 29,202, up 14 percent from 2013.Land Rover sales reached an all-time May high of 4,536, up 28 percent from May 2013, and for the year, 22,148, up 13 percent while Jaguar sales were 1,304, down 9 percent from May 2013, and for the year 7,054, up 14 percent. Volvo Cars of North America reported U.S. sales of 5,014 for the month of May, down 20.8 percent from last year. Year-to-date sales are down 9.9 percent versus the first five months of 2013. Porsche Cars North America announced May sales of 4,609 vehicles, the best ever sales month for Porsche in the U.S. For the year, PCNA has delivered 18,817 vehicles, an increase of 6.9 percent over last year. Twenty-one of 24 cars and SUVs, all 2014 models, earn an advanced or higher rating in the latest round of IIHS evaluations. 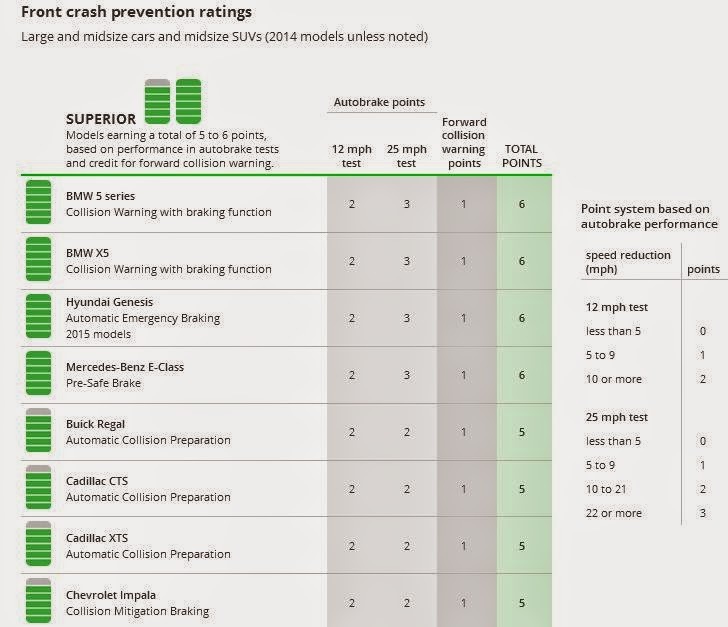 The Insurance Institute for Highway Safety's (IIHS) initial batch of front crash prevention ratings covered 74 midsize cars and SUVs and rates vehicles as basic, advanced or superior for front crash prevention depending on whether they offer autobrake and, if so, how effective it is in tests at 12 and 25 mph. Four vehicles earn perfect scores when equipped with certain options: the BMW 5 series car, BMW X5 midsize luxury SUV, 2015 Hyundai Genesis car and Mercedes-Benz E-Class car. Eight models earn the highest rating of superior, 13 earn advanced, and three earn a basic rating. Among the eight superior-rated cars are the Buick Regal, Cadillac CTS, Cadillac XTS and Chevrolet Impala when equipped with GM's forward collision warning and autobrake system and join the superior-rated Cadillac ATS and SRX, which were included in the first round of tests in 2013 .